Out Of StockNotify me when it becomes available. Auto Ship & Earn + 113 Points What's this? 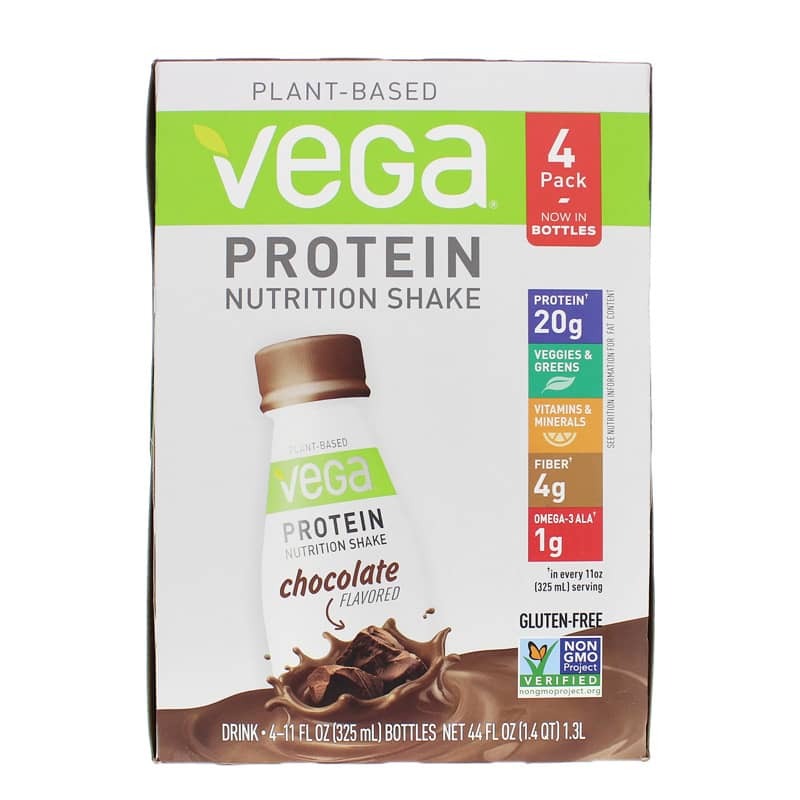 Chocolate Plant-Based Vega Protein Nutrition Shake is made with real plant-based food ingredients and provides a delicious way to help start your day strong. Ready to take with you on-the-go, enjoy a delicious shake chilled on your way out the door, while you run errands, or mid-commute. 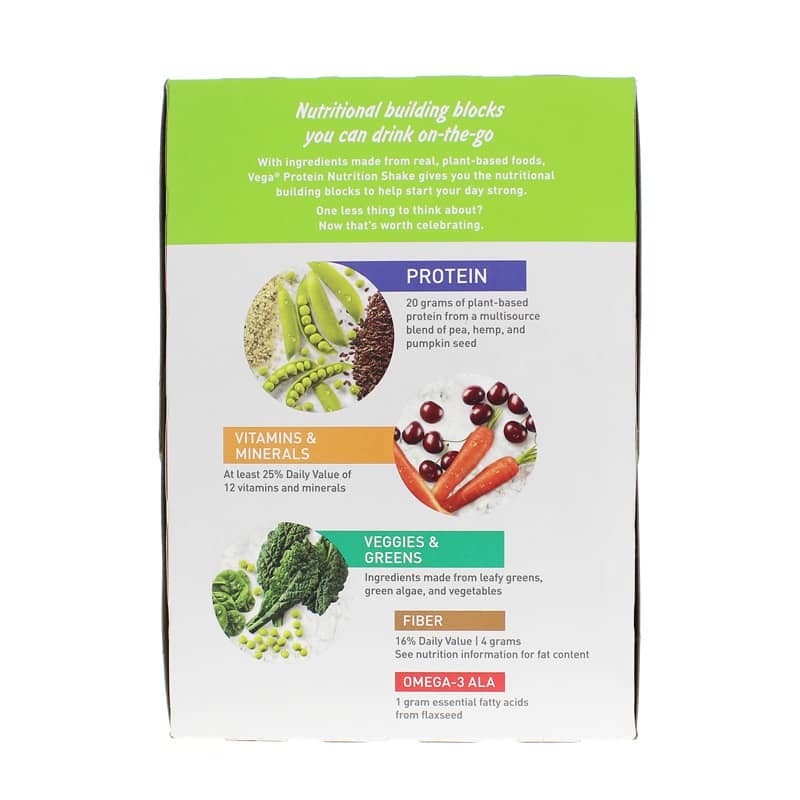 Ingredients: Water, Pea Protein, Coconut Palm Sugar, Flaxseed, Cocoa Powder (Processed with Alkali), Natural Flavors, Hemp Protein, Pumpkin Seed Protein, Spinach Powder, Cocoa Powder, Kale Powder, Acerola Cherry Extract, Carrot Juice Powder, Quinoa Sprouts (Sprouted in Water with Vitamin B1, B2, B3, B5, B6, B7 and K), Organic Spirulina, Marine Algae, Stevia Leaf Extract, Gellan Gum, Dried Fruit and Vegetable Blend (Spinach, Broccoli, Carrot, Beet, Tomato, Apple, Cranberry, Orange Peel, Blueberry, Strawberry), Sunflower Seed Oil Powder, Mushroom Powder. Contains Coconut. Manufactured in a facility that also processes soy and other tree nuts. 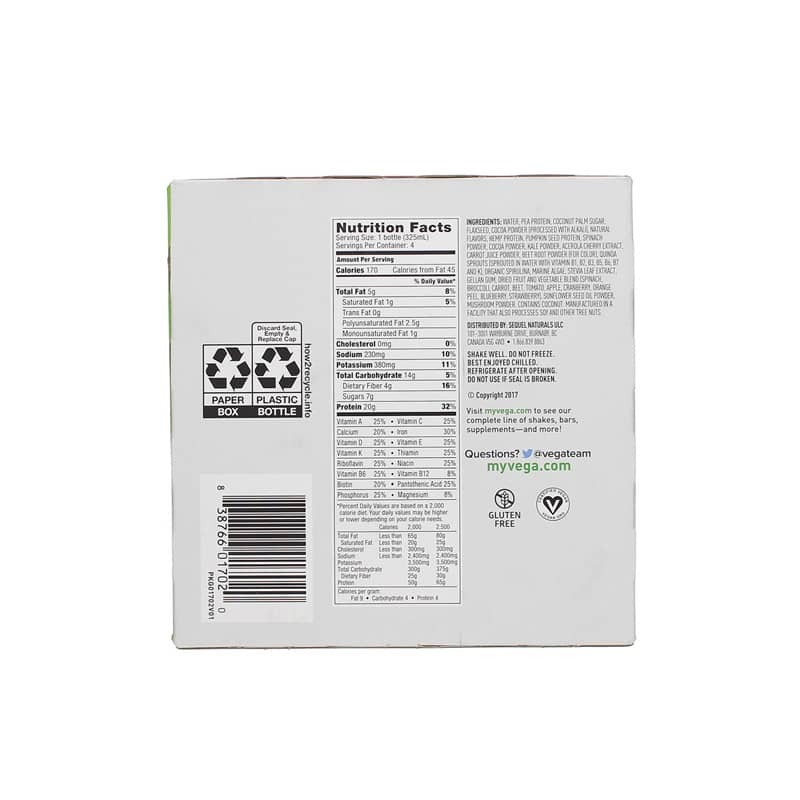 Contains NO: GMOs, gluten artificial colors, flavors or preservatives. Vegan. Adults: Shake well. Do not freeze. Best enjoyed chilled. Refrigerate after opening. Do not use if seal is broken. If you are pregnant, nursing, taking medications or have a medical condition, please consult your healthcare practitioner before taking any dietary supplement. Keep out of the reach of children. 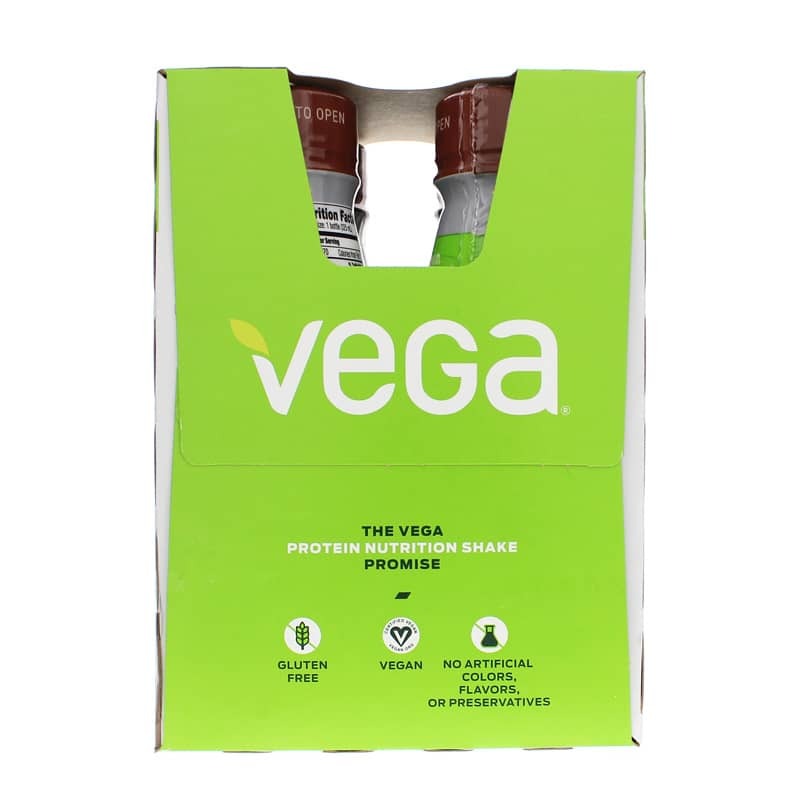 I like Vega One shakes because they're plant based and have some awesome nutrition packed into them! They are high in protein and low in carbs. I mix mine with a plant based milk and water. I stay fuller longer if I use more milk than water. It is not grainy or gritty as some shakes are. It's best mixed and left to chill for a bit before drinking IF you want a thicker shake. Just mixing and drinking is fine, too, just not as thick. The chocolate is rich and creamy. One of their best flavors, I think. I also like the mocha and vanilla chai. Highly recommend this if you are looking for a solid nutrition shake to supplement your meals or snack replacement.